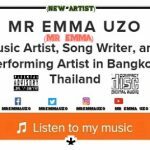 Hi welcome to Mr Emma Uzo website and nice to meet you, it’s my pleasure to announce that our foreign based music artist popularly known as MR EMMA has set to release a mind blowing song that will lift his music career more higher. The song is titled OFOR NDU(justice of life) by MR EMMA and it’s set to be release on January first,the link will be out immediately after the song release. The talented music artist has been making wave in the music industries thereby making a name for himself with some of his past songs like MY DREAMS and IT WILL BE OK which he released in between April-August 2017 and now he is back to rock the stage again. Mr Emma is open for booking anywhere and anytime, feel free to follow him on all social media with (Mr Emma Uzo)or you can google him as well. For more enquiry about Mr Emma visit this website to know more about him and stay tune for more relevant information. You can drop your messages if you have any and don’t forget to like, comments and share with us. Thanks you for your patients and have a nice day.